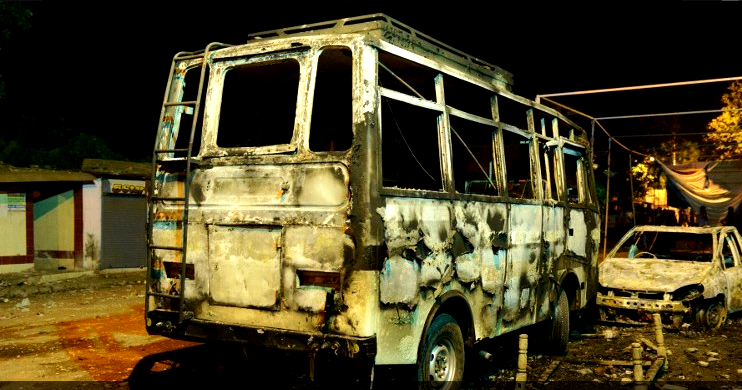 Ahmedabad witnessed a sudden communal flare up late on Sunday night as two groups clashed after an argument among local youths about a wedding. The incident took place near an area with a mixed population. Some persons, including the driver of a police vehicle, were injured in heavy stone-pelting, while three vehicles and two small shops were burnt down, police said. “The dispute started with a petty quarrel. The cause of the incident is still under investigation, but according to one narrative, youths from one community went to a nearby ‘pan’ shop to smoke. Some youths from another community objected to their behaviour. There was an exchange of words that led to a flare up. No one was seriously injured. The situation was defused in 20 minutes. While the mobs were divided largely on communal lines, at one level it was also a mixed mob, with some persons from one community being part of the other,” Manoj Shashidharan, Joint Commissioner of Police, told The Hindu. However, Rajesh Makwana, who sustained a minor injury, said the clashes lasted for about an hour before the police arrived and dispersed the mobs with tear gas. “For the past 12 years, after Godhra, there has been no incident or dispute in the area. This is a first in 12 years. The guests fled the wedding function and the wedding ‘mandap’ [a makeshift stage for wedding receptions] was also burnt down. The whole road was packed. The situation is tense, even more so because tonight there is a wedding in the other area and we don’t know what will happen. Nobody has been able to sleep last night,” he said.